On my twitter account it says I am a “leaver of crumbs.” Crumbs, pieces of the whole, are what you find on the kitchen floor after leaving the kids home for the 4th of July weekend. Crumbs are not edible and, frankly, quite messy and undesirable. 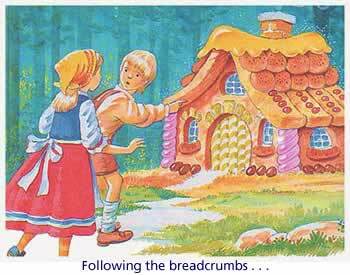 In the story of Hansel and Gretel, they were left in order to lead the way home. In account planning crumbs are good. Good account planners leave crumbs via the creative brief. Good crumbs inspire excitable, nimble minds to deliver stories, ideas and art that turn consumers into, well, consumers. Today, there’s too much consuming of content and not enough consuming of product, but that’s a story for another day. A good brief leads the creative team to an idea without giving them the idea. If you give the team the idea, they feel cheated and are not likely to use it. Of course, if you give them the idea using different words and images – and it’s worthy – it will register. This is where crumbs lead to success. Account planners who have fed the big idea know it. There is a synchronicity between the paper (brief) and the idea. A kinship…a familial relationship. The crumb bond between an account planner and creative team is special. This ain’t old school shizz either, this bond is as important between digital creatives and planners as it is in traditional. Perhaps more so, since there are so many factors involved in creating a digital selling experience. Sadly though, many digital strategists tend to be more architect than inspirer. Blueprint creator not crumb relater. Hot Peace! Previous articleSchooled in Marketing by an Educator. Next articleIt Takes a Recession. Claim and proof. An evidentiary approach. Up frontin’…the Single User Identifier.